The Horror Digest: The Grudge: I Like You..But Am I Supposed To? Ahh! I gasped when I saw this post - I just watched this (again) last week and actually have a post half-written about how much The Grudge truly freaks me out and how I'm not afraid to admit it anymore. It scares me every time I see it and I've decided I don't care if people berate me for it. Then you come along with this post and made me feel so much better. So, thanks for that - but damn you for posting yours first. Now I'm just going to look like a copy cat. 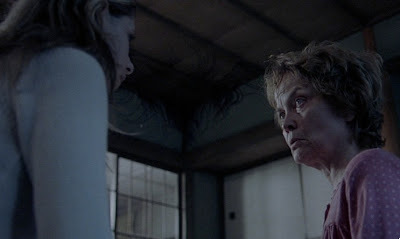 It's been awhile since I've seen The Grudge, but I think the deal with the cat and the cat boy was that they were both drowned by the awful father, along with the mother, and so maybe because of that he somehow has acquired some cat characteristics (maybe due to his love for his pet)? Or maybe they both haunt the house and are a part of the curse, and somehow that has fused together a bit? Or maybe during the creation of the curse their spirits have joined because they were both innocents? I admit, this movie creeped me out too. I remember not wanting to leave my room after I watched it, as I was the only one home at the time, and it was late at night. Aww Chris you won't look like a copy cat of course! That's so wild, I had no idea!! I didn't even know you watched it recently. Heck, I didn't know that I was going to watch it so none of us area at fault..! I'm happy a lot of people are coming out of the grudge closet though. Now to see the original! Emily--You are always explaining things to me, why are you so smart?! The cat drowned?!! They showed such a quick snippet of it I couldn't see what was happening, but I guess that makes sense. I can't believe he drowned the cat....now I can't even finish my oatmeal because I'm so upset. Sigh. I haven't watched The Grudge since I first saw it in the theater when it was released. I enjoyed it at the time but I don't know if I could bring myself to rewatch after all the years of crap J-horror/J-horror remakes that have come since. I will say, however that you must watch Ju-On, the Japanese original soon! It's so much creepier than the remake! I think this is a very well made movie. I don't understand the hate it gets, it was definitely one of the better American remakes. The atmosphere was done very well and there were a lot of creepy moments. I have to admit the scene with the bed sheet pissed me off! The bed sheet is suppose to be a safe haven and that damn ghost appeared underneath the covers! Ha. I need to own this on DVD. I really didn't like the original JU-ON. I saw it right on the heels of aRING, so I was still buzzing from that amazing movie. For me JU-ON is just a poor facsimilie if far better films from that scene. For one thing I think the mythology is not that interesting. In RING Sadako's backstory is fascinating and executed with such amazing atmosphere and mystery. Whereas in JU-ON every ten minutes you get that chick crawling along the floor and burping at the caemra. And that little naked boy turns up randomly so many times I began to wonder if Victor Salva had directed the film (cheap shots, FTW!!!). As for the remake (yes, I DID notice it was the subject of this article), they managed to make a movie just as incoherent and dull as the original so I guess it's a successful translation. Although I'm not sure I really want to see any of the 27 other sequels, remakes and re-boots Shimizu has made. Thanks Murphy Screams, that was my original intention actually to get the original but I mixed it up in the queue apparently...but yes I look forward to seeing it someday..! Greg- you are so right about that. It all goes back to one of my points about the opening of Scream--where the parents are RIGHT there but she still dies anyway. There's a certain boundary of safeness that gets crossed, and once things like under your bed covers get compromised...things get very serious indeed. Hmm I guess the mythology in comparison to The Ring is quite boring--or as I said it seemed more realistic. Although I was kind of interested in why that woman was so crazily obsessed with the professor. I don't know though I didn't see it as dull because I actually came away being genuinely scared in a similar way that I was when I saw the Ring for the first time. Maybe you're putting too much importance on comparing it to The Ring. If we compare every single movie we saw to a better movie, no one would like anything. I prefer to take it as just face value and observe it as a single entity....! After reading around, I believe the boy is meowing because the father(whom killed is wife, son, and cat) killed the boy and cat together, therefore in a way their souls were combined. I'm not exactly sure though. I don't exactly remember. I would thoroughly recommend the original Ju-On:The Curse, it's the first in the series, made in 2000 for tv but it gets confused with Ju-On: The Grudge, made in 2003 and released in the theatre, the American The Grudge is largely a remake of this. 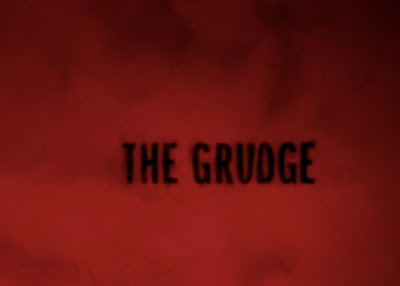 Though made for tv Ju-On The Curse is ten times scarier than the American Grudge, although admittedly as confusing. I don't think it ever got a Western dvd release so you might have to look it up on youtube, which is what I did, though it might have been released with Ju-On The Grudge.